After much planning and consideration of availability the Crafty Companion’s Cycling Circle (CCCC) charity bike ride for 2018 has now got underway. This year sees the group on their fifth consecutive ride, and as of two years ago, will finish in London, with a slight change to the former route due to the obstacle of the new road bridge at Widnes. Final planning at the centre of operations, Dr Duncan’s. Similar to the past events all expenses are paid by the team out of their own pocket, or purse, so every penny donated goes to the designated charities. Over the last four years they have managed to raise a total of £24,239.34p which has been distributed between the following; £17,815.59p for the ‘R’ Charity at the Linda McCartney Cancer Care Centre, £2,670 for Macmillan Nurses, £1,963 for the Clatterbridge Centre and £1,790.75 to the Motor Neurone Disease Association. Leaving from Liverpool in the early hours, the team had to be transported through the Mersey Tunnel, then making their way to the start of the canal route at the National Waterways Museum in Ellesmere Port. After a few quick checks of the bikes and top up of water, the group consisting of pathfinder Chris Bruffell, ‘R’ Charity representative Angie McShane, Tony Farrar, Pete Williams, Gordon Sandford and backstop Steve Walls pedalled along heading towards Chester. This is a first for the CCCC in using this part of the Shropshire Union Canal which was constructed in the 1790’s between Chester and the River Mersey. After negotiating the slight obstructions in the deep cutting at the bottom of the city walls, the team made their way through Chester past King Charles’s Tower, which legend has it as the place he used to observe the Battle of Rowton Moor, and out through Boughton to Christleton. The cyclists under starters orders, from left to right, are: Peter Williams, Gordon Sandford, Tony Farrar, Angie McShane, Chris Bruffell and Steve Walls. It was at Christleton that the group took a break at The Old Trooper, which many years ago had a fabulous sign depicting one of Cromwell’s Ironside’s. Rowton Moor battlefield just a short walk across the field on the other side of the road to this building. On leaving the Old Trooper, it was 15 miles or so to go from Christleton before they arrived at Barbridge Junction, and memories flooded back for those who had been on the 2016 ride, for now familiar territory was reached. 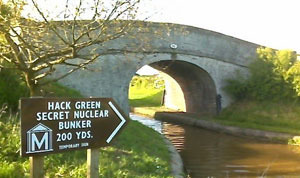 Heading through Hurleston Junction and over the Nantwich aqueduct much merriment ensued when approaching nearby Hack Green and the large sign giving direction for the ‘Secret Nuclear Bunker’. A long wait for lunch at the Old Trooper, from left to right, are: Tony Farrar, Pete Williams, Steve Walls, Chris Bruffell, Angie McShane and Gordon Sandford. Calling at the conveniently situated hostelry, The Shroppie Fly at Audlem Locks, reminded some of the immaculately positioned place for the first puncture of the 2016 trip for Steve Walls. No prize for guessing who had the first puncture for 2018, correct, Steve Walls again, although further along the canal this time. A long haul was now imminent as this trip was scheduled for taking a day less than last time, so instead off stopping at Market Drayton for the night the team carried on pedalling. Now heading through the Shropshire countryside on through the deeply forested Woodseaves Cutting, spanned by a number of tall and elegant bridges. How some wish they could turn back time, for on passing Shebdon embankment at Knighton, stands the Cadbury factory, which has its own canal side wharf. Sadly since 1962 the chocolate has been transported by lorry, otherwise a fleet of barges would have been there, a perfect spot for a tasting in times previous. From Knighton the canal passes through rural isolation, such peace and tranquillity, although a few strategically placed pubs line the route down to Norbury Junction. A good stopping place for the team yet again, containing a pub, a cafe and comfortable seating for a well-earned rest. Now with about three-quarters of the first day mileage complete the team continued southwards through Gnosall and the Boat Inn, through the spectacular Cowley Cutting and picturesque Wheaton Aston before crossing the major road arterial route, the A5, by way of the Stretton Aqueduct and into Brewood (pronounced as Brood). With tired legs, and after battling the high temperature of a mid-summers day, the Autherley Stop Lock was eventually reached, day one completed and around 70 miles ticked off. Only about another 170 to go. What, yet another break? 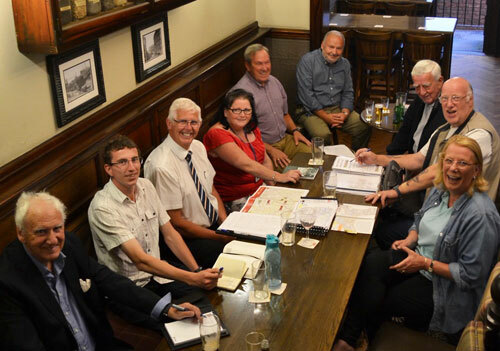 From left to right, are: Gordon Sandford, Pete Williams, Steve Walls, Angie McShane, Amanda Farrar, Tony Farrar and Chris Bruffell.